My mum’s favourite dessert ever is trifle. 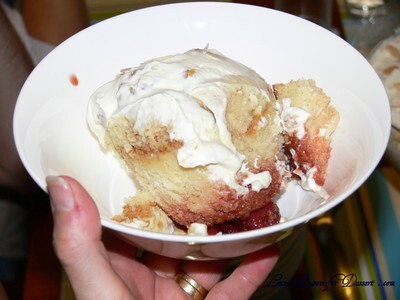 A combination of cake, alcohol, fruit, home-made thick custard and cream can’t go wrong. My idea of a trifle is probably a bit different to my mum’s and I already have a recipe lined up and waiting to make for my trifle – hint: it involves a lot of chocolate :P. Although on my mum’s birthday I can’t be selfish and make my trifle so I’ve endeavoured to find a great trifle to satisfy her trifle needs. 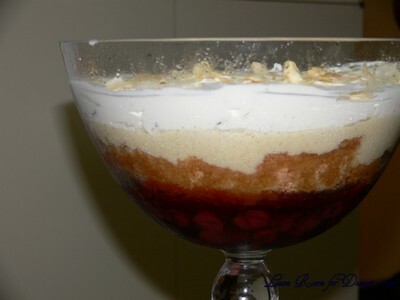 I have previously made only one trifle, so planning for this one was a bit difficult, especially since I had chosen a recipe using fresh black cherries which were already going out of season here. I decided to use bottled Morello cherries in syrup for the base, fresh made sponge, vanilla bean custard and Vienna almond cream. 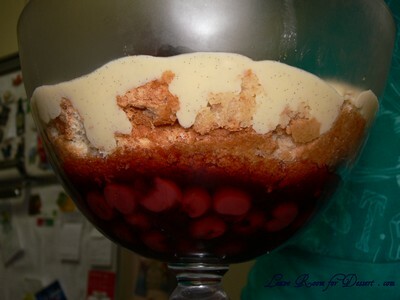 This produced an extremely lovely dessert, which looks very beautiful when layered in a lovely trifle bowl to show off all the layers. 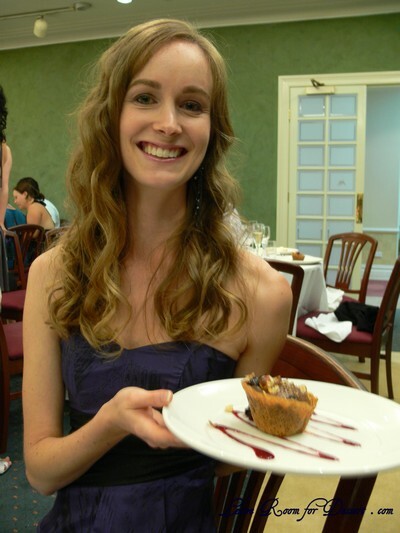 I also love food that can be prepared beforehand leaving a dinner party much more relaxed. 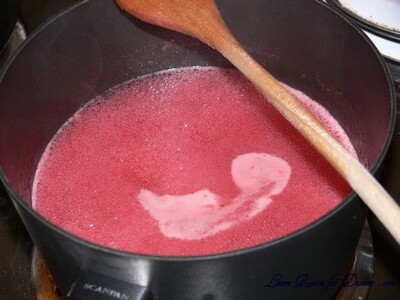 Mix the sugar, lemon juice and liquid from the cherries in a medium saucepan. Turn heat up to medium and stir until sugar dissolves. Once dissolved, bring to the boil and keep an eye on the mixture to make sure it doesn’t boil over – leave at a heat where it is boiling but not going to overflow. Continue to boil until mixture has decreased to less than ¼ its original size and become thick and syrup like (this may take a while, so you can continue on with other parts of the trifle). 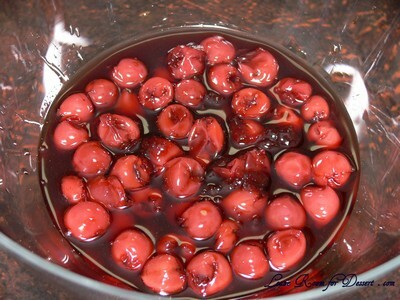 Add cherries at end and pour into another bowl to cool. 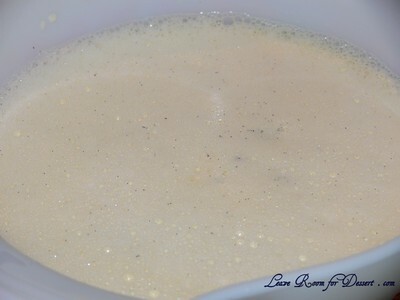 Place the milk, cream and vanilla pod in a medium saucepan, bring to the boil over medium heat, stirring occasionally. While this is occurring, beat the egg yolks with the sugar until light and fluffy. 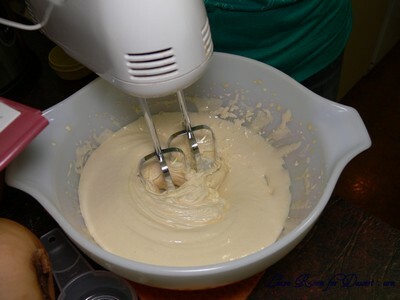 Once the cream mixture has come to the boil, pour into the egg yolk mixture, mixing constantly. Pour custard mix back into the saucepan and heat on low until mixture thickens. Do not allow custard to boil. 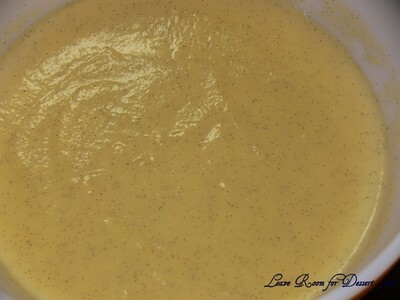 (I found this custard did not thicken a much as I expected – like the Portuguese custard tart custard I’ve made). Preheat oven to 180-200C. Mix the egg yolks with half the sugar until light and fluffy. 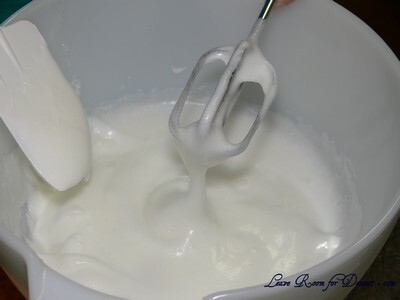 Beat the egg whites until stiff, then add the remaining sugar and beat to combine. 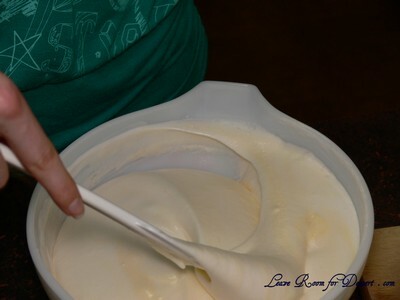 Fold the egg white mixture into the egg yolks. Sift the plain flour and cornflour together and fold through the egg mixture gently, in three batches. 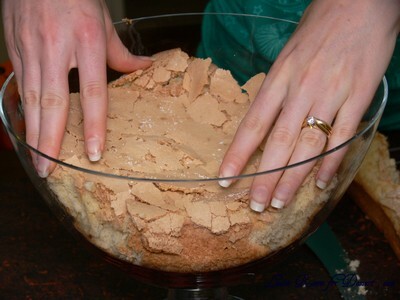 Pour into tray, cake tin or individual tins, greased and lined with baking paper. Cook for 20-30 minutes or until golden and cooked through. Stand for 5-10 minutes, then remove and leave to cool. Once cooled, place the cherry compote in the bottom of the bowl(s). Cut or tear sponge to fit into bowl and place on top of cherries. 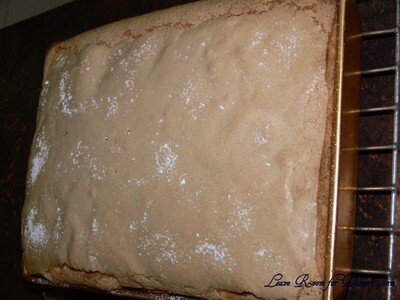 Sprinkle Marsala wine or Sherry over the sponge and refrigerate for 10 minutes. Pour custard on top of sponge and refrigerate overnight. 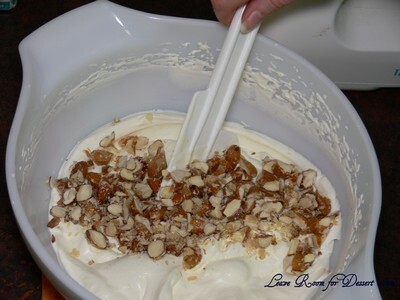 Before serving, whip up cream until thickened and add chopped Vienna almonds. 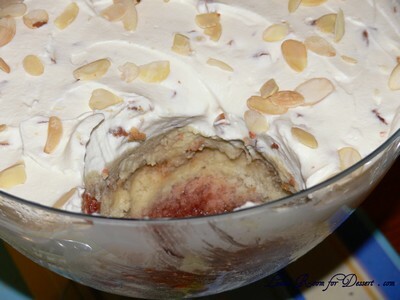 Layer cream mix over the custard layer and scatter toasted flaked almonds on top. Serve (you may serve with ice cream, but it doesn’t need it). 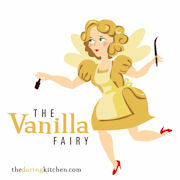 Filed under Cakes, Slices and Biscuits, Dessert, Egg Yolks, Recipes. You can follow any responses to this entry through the RSS 2.0 feed. You can leave a response, or trackback from your own site. That looks magnificent 🙂 Such a perfect bowl for your heavenly sounding trifle! 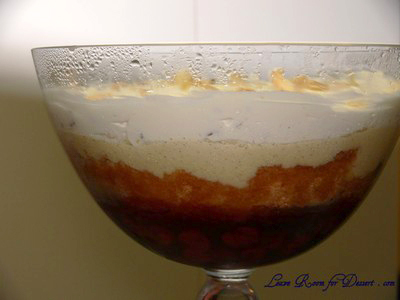 trifles are so elegant and beautiful, and this one’s no exception. i love the red cherries contrasting with the white custard. nicely done!